Note: This is a guest article contributed by frequent TIFO visitor and owner of DumpADay, Jon. 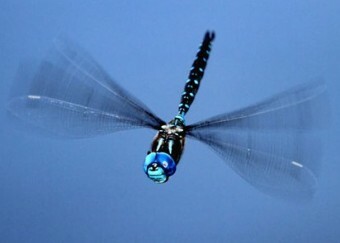 Today I found out that the dragonfly can fly up to 60 miles per hour, which makes it the fastest insect on the planet. Interestingly, dragonflies only have their wings for about 3 to 4 weeks of their lifespan. Dragonflies lay their eggs in small ponds or other bodies of water and spend most of their lives in the larva stage (up to 3 years, depending on the species). It’s not until they go through a metamorphosis process that they grow wings. So when you see a dragonfly with wings, you know his days are numbered. As young dragonflies, they feature a special appendage on their heads that they use to spear small fish or larva, making them predatory insects practically from birth. In the adult stage, (or winged stage), when you see two dragonflies chasing each other, it’s often two males, as the males are known to be territorial. When you see two dragonflies stuck together while flying… Well that one is pretty obvious, let’s just say, love is in the air. Being an insect that can fly 60 miles per hour (97 km/hr) and being able to see 360 degrees at all times, there aren’t a lot of natural predators around that can catch the dragonfly; however, there are some. Among those are frogs, which use a quick flick of their tongue to catch the tasty protein filled snack. Many types of frogs can flip their tongues out and back in less than 15/100ths of a second, which is faster than most eyes in nature can follow movement, let alone escape from. Adult Dragonflies have been useful in controlling mosquito populations. Mosquitoes are one of their primary food sources. The largest dragonfly fossil (one of the earliest) had a wingspan of nearly three feet. That makes it the largest flying insect in known history. One of the most distinguishing features of dragonflies are its eyes. Because of their large, multifaceted eyes, the adult dragonfly can see 360 degrees around it at all times. There are about 5,000 different species of dragonflies all over the world, except in Antarctica. Four hundred and fifty of the species can be found in the United States. Dragonflies are known as beneficial insects because they eat so many harmful insects such as mosquitoes, gnats, ants, termites and even butterflies, spiders, and other dragonflies. 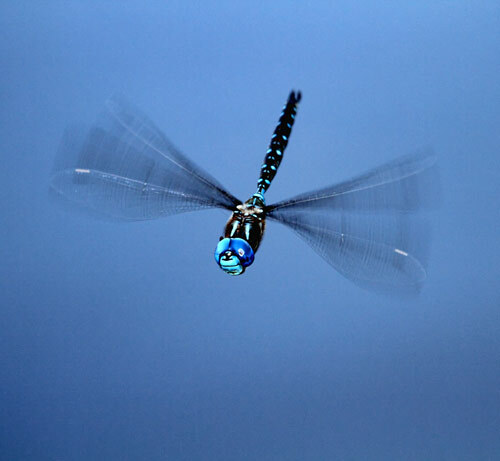 Dragonflies can fly moving in all directions, forward, backward, up and down. They can also hover. I believe they can fly at speeds up to 60 km/h, which is still very fast but only around 37 mph. Dragonflies are not the fastest flying insects, by far. The fastest recorded insect flight speed is held by the male horsefly at 90 mph, no less. Pretty astounding stuff. I remember my childhood days…I used to catch some with the help of stick and toothpaste. Poor dragonflies… ha ha ha ha ha!! !